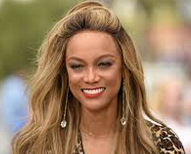 Tyra Banks is in Atlanta now shooting a sequel to her 2000 film “Life Size” where she plays a Barbie-like doll who comes to life. The original “Life Size” starred a then 13-year-old Lindsey Lohan. Will she return? Banks told Steve Harvey before production she had talked to Lohan about being in the film, but there has been no confirmation that the now 32-year-old actress will actually show up.